Bare Bones Reverse Osmosis Filtration System. It will get the job done, comes with 50 Gallons per day membrane. Suitable for City or Well water source. Bare Bones RO Water Filter - Reverse Osmosis System. It will get the job done, comes with 50 Gallons per day membrane. Suitable for City or Well water source. 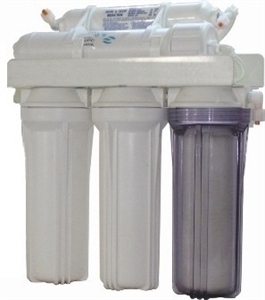 Light RO Five Stage Reverse Osmosis system begins with stage 1, a five micron Sediment filter that traps particulate matter like dirt, rust, and silt that will affect the taste and appearance of your water. Stage 2 is a five micron Carbon Block filter that provides a reduction of chlorine and other materials that cause bad taste and odors. Stage 3 is an additional five micron Carbon Block filter which provides a greater reduction of chlorine (these are called PRE-filters because they filter in front of the reverse osmosis membrane). Stage 4 is the heart of the reverse osmosis system, the RO Membrane. This semi permeable membrane will effectively remove TDS (total dissolved solids), Sodium and a wide range of contaminants such as Percolate, Chromium, Arsenic, Copper and Lead. It will also remove cysts such as Giardia and Cryptosporidium. Stage 5 is a high quality Alkaline Post Filter (this is called a Post filter because it filters after the membrane). This filter is final polishing filter used as the water is leaving the storage tank on it's way up to the faucet. It returns beneficial minerals to water- Calcium, Magnesium and Carbon for final polishing. It also Increases water Ph to alkaline level. The end result? Great tasting water! Capable of making 50 Gallons of Pure water = 378 of 0.5L water Bottles a DAY! RO water purification systems will reduce and eliminate TDS (total dissolved solids) like salts and minerals from our drinking water. However contrary to common beliefs, less than 1% of the organic minerals are actually found in most raw water supplies. With the increase of pollutants, our water supply contains mostly inorganic minerals. Inorganic minerals consist of iron, carbonate and lime compounds, which are not compatible with our bodies. The body’s cells reject these minerals leaving dissolved inorganic substances (acid crystals – minerals deposits) throughout the body. This accumulation of debris creates more work and trouble for the body, such as arthritis in joints, gallstones, kidney stones and mineral deposits in artery walls. Organic minerals that are considered soluble, which means the body absorbs sustenance into the cells, are found in our live foods such as fruits & vegetables. One glass of freshly squeezed orange juice would be higher in minerals than 30 gallons of untreated raw water. Purified water provides a necessary rinsing treatment for hydration purposes as our body is mostly fluid (over 80% water) and equally important to rinse impurities out of our body. Drinking purified water both prevents inorganic minerals from entering our bodies and removes inorganic mineral deposits already there. Continental US Free Shipping: FedEx Ground Home Delivery. Choose a Free Designer Faucet that suits your kitchen.